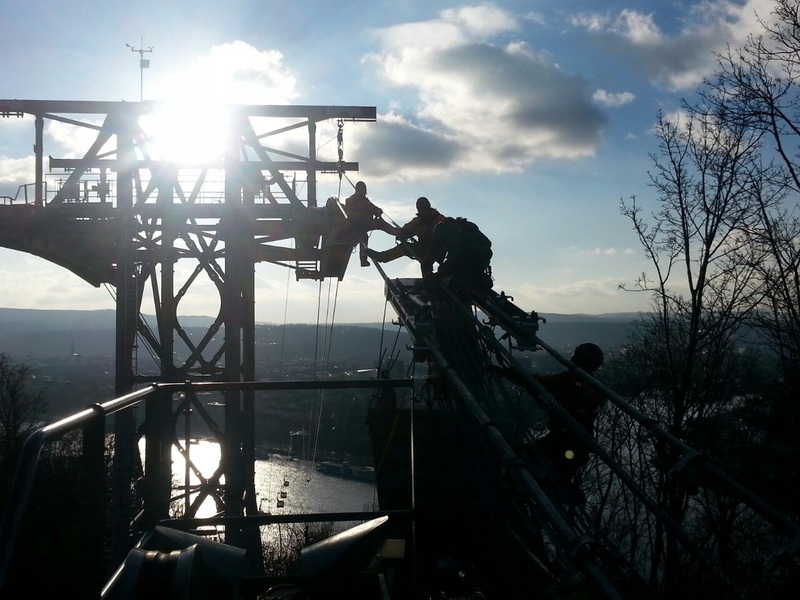 The cable car’s lower station is located within the city on the banks of the Rhine, behind the Basilica of St. Castor and very close to Deutsches Eck. The upper station is situated very near to the entrance of the Ehrenbreitstein Fortress. 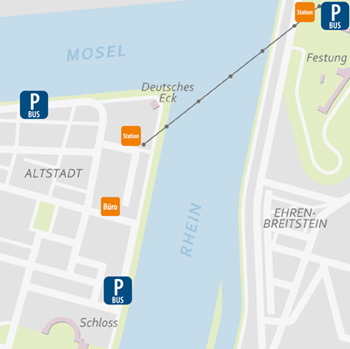 Coaches should use a dedicated coach park outside the city centre between drop-off and pick-up, as the waiting time at the pick-up/drop-off points on the banks of the river Moselle is limited to 30 minutes. Free and signposted, close to the city centre: Pastor-Klein-Strasse 4; alternatively, you can park near the fortress grounds: Niederberger Höhe (former ‘BUGA’ car park). € 0.60 for each hour (or part thereof)/ Don’t forget to present your parking ticket for the reduced rate in the entrance hall during opening hours. Access via Koblenz-Ehrenbreitstein, Niederberger Höhe (GPS: Greiffenklaustrasse). Bus route 1 from Koblenz main railway station (bay D) to bus stop "Deutsches Eck", or 30 minutes on foot. Alternatively, 20 minutes on foot from railway station “Koblenz Stadtmitte” railway station, e.g via Schlossstrasse (footpath marking: red columns). Route marked by red columns to Deutsches Eck and cable car. Ferries operate from the districts of Ehrenbreitstein and Lützel during the day (from April to September). Along the Rhine or Moselle rivers following the signs to Deutsches Eck. Landing point near the cable car (from April to the end of September). Walk along the Moselle to Deutsches Eck and then a few steps upstream along the Rhine (approx. 10 minutes).